Local developer Duffie Inc. is working on a new office buliding at New Hampshire and the Beltway that will have LEED Gold certification. Shoved up against the off-ramp for 495, 10001 New Hampshire Avenue - as it's been dubbed - "might as well have a Beltway address," boasts a marketing brochure for the 55,000-square-foot building. Developer Duffie Inc., whose headquarters are located next door, is also building the Randolph Plaza retail-and-office complex in Colesville that we talked about last month. Following the lead of the proposed White Oak Recreation Center and the Burtonsville Town Square, 10001's going for LEED Gold certification - the second-highest level on the eco-friendly construction rating scale. Duffie calls the building the area's "first totally 'green' private office space," though the website doesn't really mention what makes it so environmentally sound. The website also doesn't give a specific location. You and I might say this building's in Hillandale; the Postal Service would give it a Silver Spring address. Duffie? "Superb Montgomery County location on the Capital Beltway." I figured Silver Spring was a reputable address for a business to have now, what with the ongoing revitalization and all. On the other hand, though, all many people outside of Silver Spring know is Downtown - more specifically, the one block of Ellsworth Drive, and everything outside of that is presumably where somebody got stabbed. Maybe I'm exaggerating. But you'd at least think that sharing an address with the Discovery Channel, even if it is four miles away, would be enough for a developer to slap "Silver Spring" on his new building. I should point out that Silver Spring has the worst crime statistics in Montgomery County outside of downtown Gaithersburg. This is due, of course, to the fact that unincorporated Silver Spring covers pretty much all of the unincorporated parts of the County east of Rock Creek, excluding census-designated places which traditionally were of high density or development, such as Wheaton. 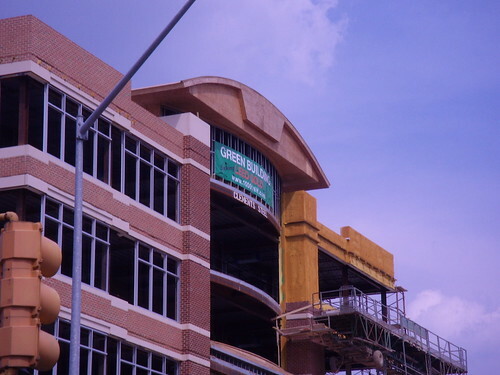 We locals understand that "Silver Spring" could mean DTSS -- freshly revitalized and significantly redeveloped -- or "Silver Spring" could mean "east Aspen Hill", which is all over the InterNet in places like MySpace and FaceBook touting itself as "gangsta 4 life" and "ghetto". Nobody who has ever actually been here would discount that touting as the least bit inaccurate. People who are with nationwide or even transnational corporations who are looking to get an office near Washington DC are not likely to make that distinction. They're going to pull up the crime stats -- especially crime stats like "theft from auto" and crimes against property such as building defacement or office burglary -- and Silver Spring stands out with red flags awave. Seriously, if people ask me where I am from, I tell them "Rockville" because that's on my mailing address. It's possible that someone from Rockville might be respectable. I tell people I'm from Aspen Hill when I want to get sympathy as I plead for more funding for anti-crime programs or more funding for more police officers or more housing-code enforcement. While I have to consider this sort of disguising of address as more than a bit shady, I have to admit that I personally understand the need to obfuscate the zipcode in order to get some respect. This office building has been in the works ever since Shoney's closed. Originally Duffie had hoped to fill this "class A" building with FDA-related businesses wanting to relocate from the Rockville/270 corridor. Maybe now they need to caste a wider net and the Beltway is quite THE "feature" of this structure. BTW, the zip is 20903--a bi-county, yet Silver Spring zip. And, inside the brochure it says Silver LEED pending? Is it gold or silver? That's the kind of development that we should have right off the Beltway. On the south side, exits lead to single family houses. Kind of defeats the purpose of a high-density roadway, doesn't it? It also acts as a visual buffer for the Hillandale community against the Beltway. Now if they'd just fix that shopping center, Hillandale could really take off. As a 20901er (real Silver Spring, but not DTSS) I honestly think these places should be given designations more in line with their census designations. My sister lives in Spencerville, near the Spencerville post office off Spencerville Road, but 20905 is Silver Spring. How about we give boundaries to these communities? We don't need to incorporate them to do so, but it would make a lot more sense than the confusing suburban blob that stretches from Takoma Park and DC to Ashton and the HoCo line. Why not zip codes? Spencerville has its own zip code (20868), as does Burtonsville (20866), meaning that they would theoretically have boundaries. Burtonsville, at least is a Census Designated Place, which means it has legal boundaries according to the Census Bureau. Silver Spring is a CDP too, but the area given to it is almost entirely below the Beltway, save for parts of Four Corners. Aspen Hill does have a branch post-office, though strangely enough, it is part of the Aspen Hill Shopping Center which has addresses in Wheaton 20906. Right across Aspen Hill Road to the north, as long as it is also east of Connecticut and Georgia Avenue, it's Silver Spring 20906. To the west of Connecticut Avenue, it's Rockville 20853. At one point in time, we got our mail from, or picked up packages at, the main downtown Rockville PO where Hungerford joins MD 355. Now we get our deliveries and do pickups at the Twinbrook facility. That being said... Personally I'd like to see Aspen Hill all in one zipcode, which might speed the mail and also would make it one unified statistical area. The rest of Silver Spring and Council District 4 would probably prefer that as well. Similarly, Wheaton-qua-Wheaton should have its own zipcode, the Flower-Avenue/Piney-Branch area should have a zipcode separate from the rest of Silver Spring. Some of my concerns, of course, center around reliable and comprehensive statistical reporting. You simply can't make plans if you don't have good metrics. In the modern day where statistics can have a very high level of granularity especially in terms of geography, more planners may be looking at things in a more granularized way; looking at zip-plus-four more than at low-res straight zipcode. Yet still, to some out-of-towner who got mugged in the 3900 block of Aspen Hill Road, and later on has to pick their new corporate headquarters site, they're likely to think "Hmm Silver Spring, that's where I got robbed, right?" -and they will pick a site in Rockville or Bethesda. I'm admittedly naive about such things, but why NOT incorporate Silver Spring and establish clear cities/towns for all of these places? For example, I'm off of Briggs Chaney and Rte. 29. Comcast says I live in Colesville, my apartment complex says I live Silver Spring, but I receive the Burtonsville edition of the Gazette. This is ridiculous. We need to establish clear communities and label them as such. Silver Spring is probably too large -- as we now conceive of it -- to incorporate. However, downtown Silver Spring ("DTSS") could be incorporated and become a town, such as Rockville or Chevy Chase Village (or whatever). Comparably, Aspen Hill or Sandy Spring or Burtonsville could incorporate. However, the problem here is that with incorporation comes responsibility. I am a bit hazy on this particular matter, but I note that most of the County's incorporated towns and cities have their own police department, and their own local-government structure. Probably a good re-reading of the County Charter and related Maryland law might be in order. The idea of incorporating Aspen Hill has in fact come up, I seem to recall that my response was something to the effect of "if you think it's really a good idea to incorporate one of the poorer neighborhoods in MoCo, that's sort of like stealing an AMC Pacer with serious rust problems, I mean you could try to fix it up but it is what it is". Places like Chevy Chase Village would find it sensible to incorporate, as would DTSS; they'd be isolating themselves to some degree from the liabilities of less wealthy communities. For the less wealthy communities, it doesn't make much sense to isolate yourself from the wealthier parts of the unincorporated County.